Recipe from May 2013 issue of Every Day with Rachael Ray magazine. 1. Preheat the oven to 425 degrees. Place the crushed pretzels on a large plate. Set a rack in a rimmed baking sheet. 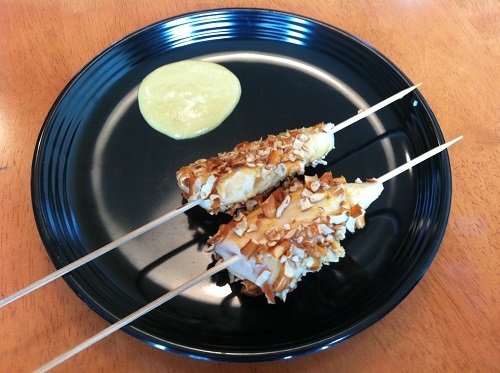 Thread a piece of chicken onto a 6-inch skewer. Repeat with 23 more skewers. Brush the chicken all over with 1/4 cup mustard. Roll each chicken skewer in the crushed pretzels to coat. Transfer to the prepared baking sheet. 2. Bake the chicken skewers until cooked through, 12 to 15 minutes. Stir the honey into the remaining 1/4 cup mustard and serve on the side, for dipping.